John Smith is a former agent for the British Secret Service. He worked in that capacity for quite a few years and was, according to his boss, one of the best. Even several enemy agents that he meets agree that at his best, he was extremely good. Eventually, however, the callousness and brutality of the missions he gets finally weighs too heavily on him and he knows that he has to get out. Knowing also that his boss, a man called Max, would not allow him to leave without incentive, he began to create a dossier on the missions. Using this as blackmail, he gets his release. Despite the tag of being an anti-hero, Smith is just a man who has had to do too many bad things and wants to be left alone. After so many years of working on his own, he chose poorly the enquiry agency business which he doesn't enjoy and isn't too successful at. Five years pass prior to the start of the series, time in which Smith gets married and divorced, starts his own private investigator business and sees it coming almost to an end with a lack of clients. Then a job for his ex-wife gets him involved in what seems like a standard divorce case, hers, and suddenly he is inveigled back into the cloak-and-dagger world. The Max for whom Smith worked when he was an active agent and who forced him back into involuntary service is a particularly nasty piece of work, a man that Smith greatly dislikes and distrusts, with good reason, and the perfect man for the job that he does, a job that is filled with deceit, back-stabbing, lying, and the like. It is Smith who is not so into the work. Luckily, he distrusts everyone enough to believe nothing he is told. Approached by his ex-wife to help get the goods on her next husband, John Smith winds up in a wild triple-cross between British, Chinese, and Soviet agents over a notebook filled with coded names of deep-cover operatives, all thanks to Max's machinations. 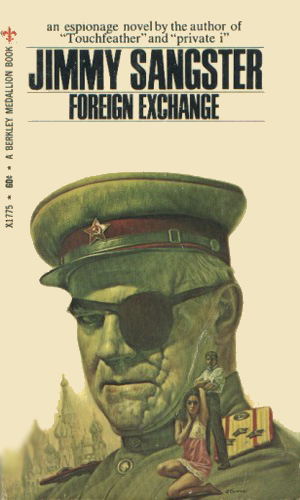 With money very tight and business even tighter, John Smith is regrettably willing to go along with Max's scheme to 'sneak' a double agent into Russia even this means that he must let himself get caught as a spy inside the Soviet Union. John Smith is a private eye who is arrested for murder and given one chance to get out - he has to find a notebook holding the names of agents inside Red China. John Smith thought himself out of the spy business until he is conned into helping out with a spy swap with Russia. He finds he is again in far deeper than he wanted. I tend to worry when a series gleefully bills its protagonist as an 'anti-hero' but I bucked-up and tried him out. I was glad that I did because even though the main character is by no means an ace agent any more, he once was and he hasn't lost his skills, just his drive. He is an anti-hero only because he no longer believes in the “job” or the motives of the people who run the show. He is a cynic largely because experience has shown that to be the safest route to take. Sangster's writing is smooth and easy to read and the stories move along quite nicely. The characters are believable and fit in with the stories. The plots are good, thought-out and highly entertaining. John Smith is as anonymous as his name suggests and his two adventures are firmly stuck in the Le Carre mold of spy fiction. Espionage is a dirty, tricky, back stabbing business and Smith is pulled left, right and centre by good and bad guys and women. Weary prose adds to the overall down at heel feel. The sequences set in Soviet Russia disn't convince and Smith's alcohol consumption is monumental - it's no wonder he keeps making mistakes. 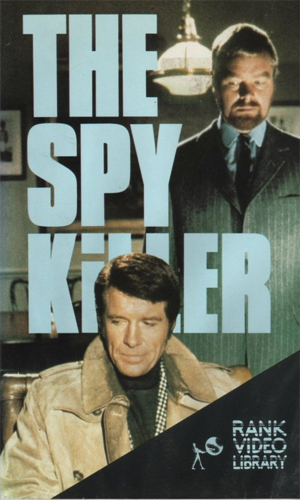 I've also seen The Spy Killer movie and it's sharper in tone than the novel, if equally bleak.